Success is its own reward. Of course, a shiny, glass trophy is also appreciated. 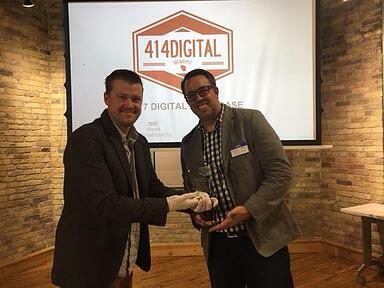 Stream Creative ended November 2017 on a high note when the team brought home the Made in MKE award for Best Digital Display from the 414Digital Showcase. Jason James and Brian Brinkman accepted the award in recognition of their work on the Community Impact Report completed for Goodwill Industries of Southeastern Wisconsin (SEW) and Goodwill Chicago. 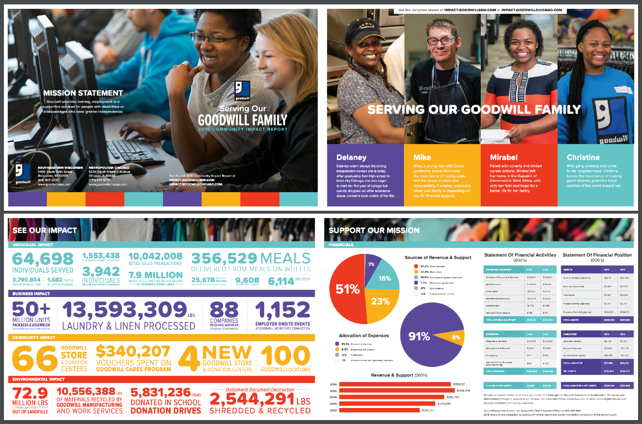 Goodwill SEW approached Stream Creative about redesigning their annual Impact Report. The challenge with the project was to find a way to make the data-heavy report more interactive and engaging to draw the viewer in and share all the great things Goodwill SEW and Chicago are doing in their communities. Stream Creative team members Brian Brinkman, Jason James and Jon McLaren designed and developed a microsite that leveraged video and interactive HTML5 elements to bring Goodwill's impact stories and data to life. In addition to the microsite, a companion print piece was designed to be mailed to community leaders and donors. The print piece was designed to show a portion of the data available on the microsite (to save on printing costs), and encourage the viewer to visit the microsite to learn more. A horizontal reverse z-fold layout was chosen to break up the data into natural sections and to encourage displaying the piece as a poster. 414Digital is a group of digital marketing professionals working to provide opportunities to network, educate and share expertise. The Made in MKE awards were judged by a panel of selected board members. 414Digital’s digital showcase is an end-of-the-year gathering for Milwaukee digital marketers and an opportunity to share work and discuss the future of digital marketing. Vendors and marketing pros gathered to celebrate end-of-the-year marketing successes and featured keynote Mike Grahl, Chief Digital Officer for the Milwaukee Bucks, discussed digital transformation in Milwaukee. Are you ready to add more interactive elements to your campaign outreach? 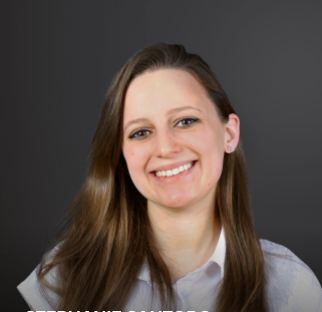 Stream Creative can help evaluate what tools would best support a comprehensive inbound marketing strategy.